08x08x1 8" x 8" x 0.75"
10x10x1 9.75" x 9.75" x 0.75"
10x20x1 9.75" x 19.75" x 0.75"
10x24x1 9.5" x 23.5" x 0.75"
12x12x1 11.75" x 11.75" x 0.75"
12x18x1 11.75" x 17.75" x 0.75"
12x20x1 11.75" x 19.75" x 0.75"
12x24x1 11.75" x 23.75" x 0.75"
12x25x1 11.75" x 24.75" x 0.75"
12x30x1 11.75" x 29.75" x 0.75"
12x36x1 11.5" x 35.5" x 0.75"
13x21.5x1 13" x 21.5" x 0.75"
14x14x1 13.75" x 13.75" x 0.75"
14x15.5x1 14" x 15.5" x 0.75"
14x18x1 13.75" x 17.75" x 0.75"
14x20x1 13.75" x 19.75" x 0.75"
14x24x1 13.75" x 23.75" x 0.75"
14x25x1 13.75" x 24.75" x 0.75"
14x30x1 13.75" x 29.75" x 0.75"
15x20x1 14.75" x 19.75" x 0.75"
16x16x1 15.75" x 15.75" x 0.75"
16x20x1 15.75" x 19.75" x 0.75"
16x24x1 15.75" x 23.75" x 0.75"
16x25x1 15.75" x 24.75" x 0.75"
16x30x1 15.75" x 29.75" x 0.75"
16x32x1 15.5" x 31.5" x 0.75"
17.5x23.5x1 17.5" x 23.5" x 0.75"
18x18x1 17.75" x 17.75" x 0.75"
18x20x1 17.75" x 19.75" x 0.75"
18x22x1 17.75" x 21.75" x 0.75"
18x24x1 17.75" x 23.75" x 0.75"
18x25x1 17.75" x 24.75" x 0.75"
18x30x1 17.75" x 29.75" x 0.75"
20x20x1 19.75" x 19.75" x 0.75"
20x21.5x1 20" x 21.5" x 0.75"
20x21x1 19.75" x 20.75" x 0.75"
20x22x1 19.75" x 21.75" x 0.75"
20x24x1 19.75" x 23.75" x 0.75"
20x25x1 19.75" x 24.75" x 0.75"
20x30x1 19.875" x 29.875" x 0.75"
21.5x23.2x1 21.5" x 23.25" x 0.75"
22x22x1 21.75" x 21.75" x 0.75"
23.5x23.5x1 23.5" x 23.5" x 0.75"
24x24x1 23.75" x 23.75" x 0.75"
24x30x1 23.875" x 29.875" x 0.75"
25x25x1 24.75" x 24.75" x 0.75"
30x30x1 29.5" x 29.5" x 0.75"
30x36x1 29.5" x 35.5" x 0.75"
FiltersFast air filters are an economical alternative if you are looking for a quality air filter without paying a premium price. 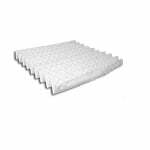 Filters Fast replacement air filters come in a variety of sizes and are a cost effective upgrade from simple fiberglass or poly pleated filters. 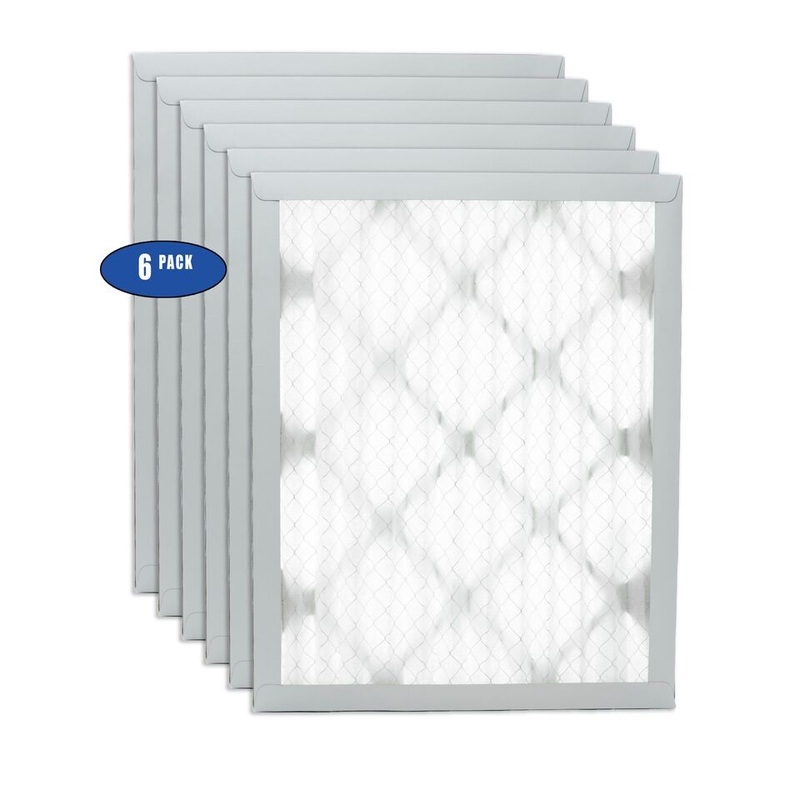 The Filters Fast filter is equivalent or better than the Dupont Silver, Dupont Silver Extra, Dupont Bronze, Dupont Contractor, Dupont Allergen, Filtrete Micro Allergen and many of the other top name brand air filters and is available at a fraction of the cost. This pleated filter is available in both a MERV 8 filter efficiency or MERV 11. MERV, or Minimum Efficiency Reporting Value, indicates when a filter will be least efficient. So, the higher the MERV rating, the more efficient the filter. Most fiberglass spun filters, such as those found in your local grocery store, are usually only a MERV 1 or MERV 2. This can affect the efficiency and air flow of your heating and cooling system, causing it to work harder to produce the same air flow, while costing you more money! These MERV 8 air filters effectively reduce pollen, dust, pet dander, and other fibers from your indoor air. Removing these airborne particles can help alleviate allergies and sinus irritation that can cause watery eyes, itchy throat, coughing, and sneezing. Aside from the health benefits, this HVAC air filter in your home will also extend the life of your heating and cooling system by making it work more efficiently. 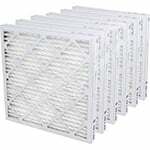 These MERV 8 filters contain 14 pleats per linear foot which creates a greater surface area to catch airborne particles. These HVAC filters should be changed every 1 to 3 months for optimum performance. Prices listed are for a 6-pack of filters. For most homes, this is a year's supply -- and at a GREAT value! Please note that Filters Fast Air Filters sizes listed are nominal sizes. The actual size of the filter will be smaller than indicated. For example, if you select a 25x25x1 air filter the actual size of the air filter you will receive will be 24.75x24.75x.75. Listing nominal size instead of actual size is an industry standard for most air filter brands so if your current filter says 25x25x1 in most cases this will be a nominal size. In some older homes, and in other cases you may require the actual size. If you require the actual size you will need to place a custom order with a representative. 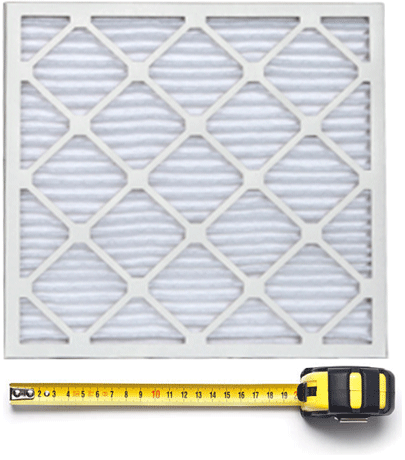 If you are unsure whether you need actual or nominal size simply measure your air filter before placing your order. Don't see the size you need? Let us build you a custom filter!